Hey, Democrats, what’s the big idea? No, really. What’s the big idea? 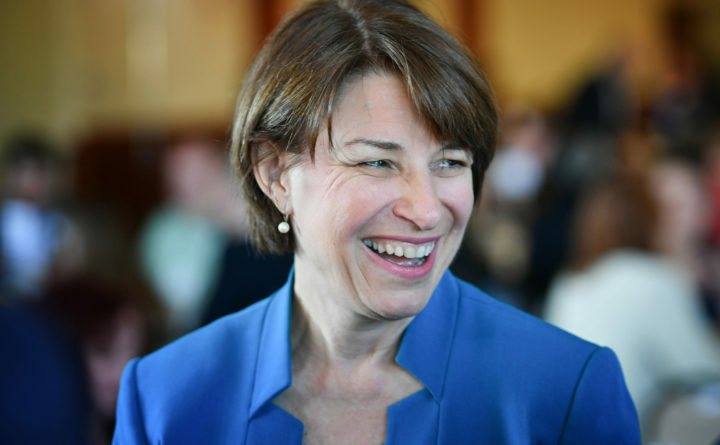 Sen. Amy Klobuchar, photographed at a fundraiser in 2017, is leading a group of Corn Belt senators in petitioning the EPA to stop issuing waivers exempting some oil refineries from federal biofuel laws. A dozen possible Democratic presidential candidates assembled at a downtown Washington hotel Tuesday for one of the first cattle calls of the 2020 campaign. The good news: There were, on that stage, all of the personal qualities and policy ideas needed to defeat President Trump. The bad news: These qualities and ideas were not in any one person. The perfect candidate to dethrone Trump would have Sen. Sherrod Brown’s (Ohio) blue-collar appeal, the youth of Sen. Chris Murphy (Connecticut), the looks of Rep. Joe Kennedy (Massachusetts) and the moral clarity of Sen. Bernie Sanders (I-Vermont). She would have the sensibility of Sen. Amy Klobuchar (Minnesota), the feminist firepower of Sen. Kirsten Gillibrand (New York) and the populist fervor of Sen. Elizabeth Warren (Massachusetts). He would have Julian Castro’s oratory, Sen. Cory Booker’s (New Jersey) facility with data, the earnest wonkery of New York City Mayor Bill de Blasio and Washington Gov. Jay Inslee, and the wealth of Tom Steyer. That ideal candidate would also be able to harmonize the cacophony of agenda items I heard over several hours: higher minimum wage, huge infrastructure spending, more broadband access, two years of free college, free public universities, universal pre-K, universal health care, fair housing, police reforms, national paid leave, equal pay for equal work, clean air, clean water, climate action, LGBT rights, cracking down on predatory lenders, tax incentives for poor areas, a federal job guarantee, election protections, as well as criminal-justice, campaign finance and immigration reforms, and higher taxes on the wealthy and corporations, gun control and more. In fairness, the Center for American Progress’ annual Ideas Conference was structured to cover the full range of progressive ideas. But it also served to highlight the difficulty Democrats will have in developing a coherent alternative to Trump. Many of the ideas advanced have widespread support, and many are big ideas. But the best way to put them all together still bedevils Democrats, just as it did Hillary Clinton, who in 2016 had a proposal for everything but seemed to say nothing. For November’s midterm elections, it may be enough for Democrats to say they are against Trump. Congressional Democratic leaders took a stab at a unified agenda for 2018 — “A Better Deal” — and were roundly mocked by progressives. But to beat Trump, they’ll need more. Trump convinced tens of millions of Americans that they are losing ground because of immigrants, racial and religious minorities, and foreigners. What will Democrats advance to counter that grim message? Booker, using a roving microphone to deliver his keynote, auditioned as “one of those senators who, when I shop at my local bodega, I see people using food stamps.” Brown offered his crossover appeal: “Trump won my state by almost nine points.” Klobuchar went for regional appeal: “The Midwest cannot be left behind at the gas station in 2020.” De Blasio let them know New York crime is down four years in a row. “I’m writing a children’s book on the history of suffrage,” Gillibrand announced. “I co-authored a book on clean energy a few years ago,” Inslee said. They also tried out some prospective campaign lines. “If it wasn’t Lehman Brothers, but Lehman Sisters, we might not have had the financial collapse,” ventured Gillibrand. Yes, but which way? The would-be candidates pointed in all directions. This is a big idea. Maybe the big idea. Whoever can best make that case should lead the Democrats in 2020. Dana Milbank is a columnist for The Washington Post. His email address is danamilbank@washpost.com.